In our society, a man or woman is only as good as their word. In some cases, their word is their bond and the way that their integrity is measured. Often we see ‘the metal that they are made of’ right in the midst of adversity. Do they stand by their convictions or are they quick to modify them in order to blend in to the prevailing winds of public opinion? If a politician flip flops in their stance in order to win more votes, they are usually criticized for not being consistent and true to their word. The thought is that if they are willing to change their convictions on the turn of a dime, how can they be trusted? After all, if they’ve changed their stance once, chances are they will do it again. If you watch the news, you will quickly discover that society in general, wants leaders to be authentic. I think in some ways, we are all longing to see this kind of courage on display because it is a leader's steadfastness that will provide a stability that their followers crave. Unfortunately what we really need is not always what we get. In the Western world, we are increasingly becoming more afraid to be unwavering in our convictions. This is resulting in a societal turning away from a belief in absolutes. More than ever it seems, we are seeing our culture veer toward a subjective relativism where absolute truth is considered passé. In the name of progress, we are quick to throw out many expressions of absolute truth that we once believed in for the sake of being relevant to a rapidly changing culture. The height of the bar of what’s acceptable is being changed so quickly today that it takes a daily dose of social media updates to find out what the new normal is. For those of you who know me and know what I have been about these past 18 years, please be assured that this is not a call to some right wing form of legalist fundamentalism. If anything, I think that harsh, judgmental religion has played a huge role in cultivating where we are right now and I have no interest in defending or enabling its destructive devices. At every opportunity, I prefer to stand with the accused rather than those who would like to throw stones. It is just that I think we are now seeing an over reaction to generations of religious abuse. Instead of being a true manifestation of God’s heart for every one of His little ones on the planet, we (the Christian community) have at times, offered a rule book to those who would want to join us and very little grace to those who would decline our invitation. The result is that many in our culture have been so wounded and confused that they have thrown out any hope of being loved and accepted by God and replaced Him with a morphing secular humanism that has ever expanding goal posts. It is easy to understand why people who have been hurt by religion would want to get as far away from it as possible. But sometimes the pendulum can swing too far and serve only as a knee jerk reaction to our Abba’s misrepresentation. I think the huge paradigm shift that we are currently experiencing will present us with even greater opportunities to express the love of Christ to a lost & broken world. However, in the midst of all the changes we are seeing, more now than ever, I am convinced that as believers, we need to hold fast to the rock solid foundation of God's Word. And it is for this purpose, that I decided to write this week’s blog. Jesus so honored His Father’s words that He refused to speak even one word without first hearing it spoken from His Dad (John 14:10). In Hebrews 1:1-2, the writer tells us that in times past, God spoke through the prophets but now He is speaking through His own Son. So if we are called to be conformed into the image of the Son, it only stands to reason that we too, would hold the Word of God in high esteem just like our Big Brother… right? Now before I go any further, I want to address some of the issues that inevitably come up when we discuss the authority of the Scriptures. Keep in mind, I am not a theologian and I function best when my worldview is kept as simple as possible. As I often have said before, if the Kingdom belongs to little kids (Luke 18:15-17) then the gospel has to be so simple that a little child can grasp it. So here are some thoughts from a self described… little boy with a big Dad! First things first. We are not supposed to worship the Bible. In the Old Testament, God instructed the Israelites to make a bronze serpent and put it on a pole so that all of Israel could be healed. What was meant to be an instrument of healing became a source of idolatry when the bronze serpent was kept past its expiry date and worshiped for generations as an idol (2 Kings 18:4). So the moral of the story is simply that we need to be careful to worship the only true God and nothing else… including the Bible. It is helpful for us to remember that the primary purpose of the written Word is to point us to Jesus who is the Living Word (John 5:39). It would be also wise for us to keep in mind that apart from the inspiration and interpretation of the Holy Spirit, the letter will end up killing us and everyone we try to use it against (2 Corinthians 3:6). The glorious truth is that God’s Word is living and active (Hebrews 4:12) and will always lead us into a more intimate relationship with the Godhead! May the Spirit teach us how to read God’s Word with the open eyes of our heart (Ephesians 1:18), all the while listening for the tone of our Great Shepherd’s voice (John 10:27). I am confident that if we embrace a posture of humility when we handle the Holy Scriptures, we won’t worship them, we won’t legalize them, and we certainly won’t reduce them to a collection of out of date fables that are no longer relevant. They will simply point us to a moment by moment relationship with the great ‘I AM’. 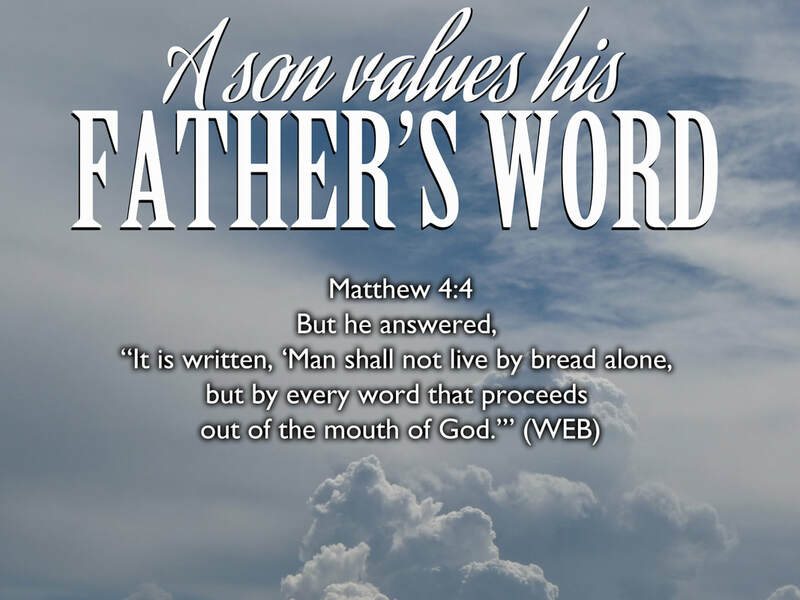 While God’s Word is eternal and expresses Papa’s heart for the whole of humanity, it is deeply personal as well. When we read it through the lens of our own life experiences, certain passages will literally jump off the page at different seasons in our journey. As someone who has been deeply impacted by God’s Father heart, I tend to have a special place in my heart reserved for every verse that speaks of His love and affection for me. For others, themes of justice, or the end times, or worship, or evangelism might be the verses that stand out… and that is what makes the Word of God so personal and tailored to our deepest needs. There is no question that with so many different perspectives, life experiences and cultures around the world, we will all read the Bible through different subjective filters. That will of course, lead to disagreement and that is completely okay as long as we all remember to do everything in love. My only concern is when we begin to start deconstructing the Scriptures in order to explain away the things that don’t fit within our theology. I think it would be much better for us to live with the tension of what we perceive as contradictions rather than feeling the need to have a clear cut answer for everything. I think sometimes the best, most authentic response for the hard questions that aren't clearly answered in the Bible is to simply say… ‘I don’t know’. If we start removing or dismissing texts that don’t fit with our own personal convictions, we have opened the door for anyone to remove the texts of their own choosing as well. The end result is a slippery slope of interpretation where even the resurrection of Jesus might be called into question by those who don’t think it to be believable. My prayer is that we would remain faithful to the Scriptures even when the words don’t make sense to our rational mind. My prayer is that we would live with a childlike trust in our Papa and simply believe His word to be true. May we have the perseverance to hold on to every promise of His love found in His Word even in times of great hardship (Romans 8:35-39). My prayer today is that in the midst of the roller coaster that our culture is on at the moment, we would all find safety and security knowing that God is the same yesterday, today and forever (Hebrews 13:8). He is not a man that He should lie, He always keeps His promises and He is true to His Word (Numbers 23:19). All we are called to do is hold fast to what we have believed (Hebrews 10:23) with the heart of a little child (Matthew 18:1-4). Think of it this way… If the words are changed in a book, a song or any published article, they cease to be an accurate representation of the author. That is why our society has recognized the importance of protecting a person’s words by creating copyright laws. Though God’s Word is not chained (2 Timothy 2:9) and not subject to earthly rules and regulations, the idea is still the same. If we somehow diminish the role of His Word in our lives, we risk creating something fashioned in our own image rather than us being conformed into the image of God Himself (Genesis 1:27; Romans 8:29; 2 Corinthians 3:18). May we never bow to external pressure to change, delete or disregard the words recorded in the Holy Scriptures. But having said that, may every word be lovingly filtered and interpreted by the Holy Spirit that lives within us. If we do that, we will continually be pointed to a loving Father who extends an invitation for all humanity to join Him in an everlasting celebration that is centered in the heart of His beloved Son.